I have some buttons hyperlinking to pdf's located on an intranet. The links are not working - client gets an error message. Any advice? Can share the error with us? It may help in determining the cause. Is this just happening for one specific person, or anyone that attempts to view the PDF? Right off the bat, first thing I would check is the name of the file. Are there any spaces, underscores, or any other special characters in the name? If so, try removing them and see if the link works properly. Could it be too long? What is the exact error message the client gets ? Is there a chance that you as an exterbal get remote access to their system. We are in different countries! When they click on the button with the hyperlink - nothing at all happens. No error message. Could it be anything to do with Storyline and network permissions? Although the person testing the course does have access to the files. if they cut/past the hyperlink in a new browser window, does it work? Is your course deployed on a server, or on a workstation machine (normal PC) ? It might be that a firewall is preventing the server upon which you deployed your course is preventing access. An other reason could be Macromedia security settings preventing to access to the intranet. If client is hosting on an intranet (not an LMS), should I publish to CD or Web rather? I have been publishing to web, but maybe I should do CD rather? I do not have enough experience in this. I know we had issues when publishing our Articulate presenter training courses on our intranet. We had all kinds of policies running which prevented us from publishing it; We used to use Sharepoint (luckily no more) and most of our problems are solved. Does this company have an IT section/department/service with whom you can discuss ? Problem solved. 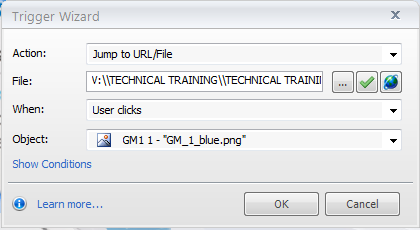 With "Link to file" trigger" - when Storyline publishes, it puts files in /external files directory. I manually moved files into root directory (where story.html) is after publishing - works now. "Problem solved. With "Link to file" trigger" - when Storyline publi..."
"Hi Lucia, glad to hear all's solved now. Just remind the customer, ..."